The Italian manufacturer collects the first place in the world-class rally raid thanks to Nasser Al-Attiyah and Overdrive Racing. The Dakar Rally 2019 was definitely an unforgettable one for EVO Corse. 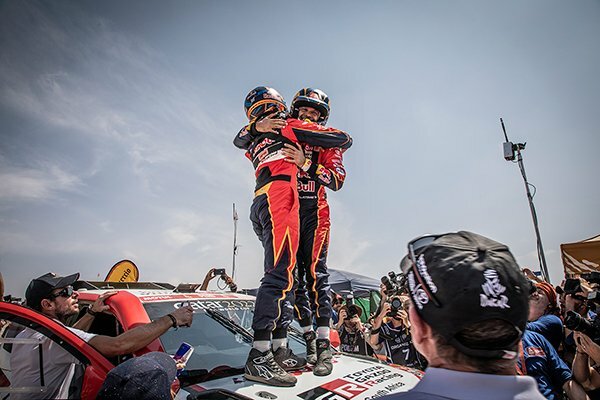 Nasser Al-Attiyah and Mathieu Baumel, on a Toyota Hilux with DakarCorse rims, brought the Italian wheel manufacturer on the top of the podium of the most important rally-raid of the world. Al-Attiyah and Baumel, supported by Toyota Gazoo Racing South Africa and Overdrive Racing, dominated the demanding race in southern Peru from the very beginning, winning three of ten special stages and ending the competition with a margin of 46 minutes and 42 seconds. For the Qatari this was the third career Dakar victory, and the first history for Toyota, which is also the first manufacturer to win this race with a petrol-powered car in the South-American era.